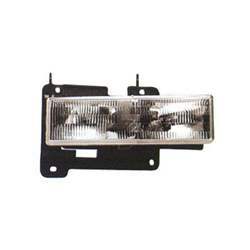 Save money over the Dealer with our New Replacement Passenger Side Head Lamp Assembly manufactured by Action Crash. Placement of the part is on the Right Side of the vehicle. The Head Lamp Assembly has a Composite Type design. Part number GM2503101V with OEM reference number(s) 15034930.